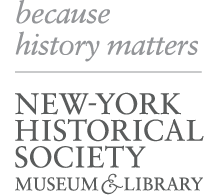 High school girls (grades 9-12) will have the unique opportunity to explore the digital humanities at New-York Historical Society. Participants will have behind-the-scenes access to our Center for Women’s History where they will meet with curators and graduate fellows, and influential women in the technology field as well as conduct research on the historical figures and events that continue to impact young women today. Participants will then share their scholarship through dynamic digital projects by learning basic html and CSS code to create retro websites to be hosted by New-York Historical Society. In Tech Scholars I, participants will learn basic html and CSS code and then share their scholarship through dynamic digital projects by creating retro websites to be hosted by New-York Historical Society. In Tech Scholars II, participants will expand their CSS and web design skills as they curate and build an online exhibit, focusing on objects of their choice from our museum collections. They will leave the program with a collaboratively developed site and a deeper understanding of CSS design principles and HTML best practices. Students who have completed Tech Scholars 1 or who have foundational HTML and CSS skills are eligible to apply for this program. Explore past Tech Scholars’ projects here and here! Summer Tech Scholars II: August 19th – August 23rd 2019, 10am – 3 pm. Apply here! The Tech Scholars programs are open only to young women in high school. The application form for the Summer Tech Scholars II program may be found here. Applicants must provide a valid photo ID (school ID, state ID, passport, IDNYC, etc.). Participation is $300 with Family Membership to N-YHS or $350 per student for non-Members. Participation in DOE Tech Scholars programs is free. Full and partial scholarship opportunities are available to applicants who have qualified for free or reduced lunch in the past. Important support for Tech Scholars provided by Susan Waterfall and Susan and Robert E. Klein. In commemoration of the 50th anniversary of the Stonewall Uprising, teens are invited to learn about the history and bravery of LGBTQ activists who helped to pave the way for the freedoms we experience today, and about the injustices that remain. This program gives teens the unique opportunity to meet and hear the stories of LGBTQ activists from the 1980s and today. Scholars will then produce oral histories, gaining hands-on experience with our state-of-the-art audio production equipment. All application forms must be completed by the applicant and submissions will be reviewed on a rolling basis. We will stop accepting applications once each program is filled. The application form for the Stonewall Scholars program may be found here. Participation is $300 with Family Membership to N-YHS or $350 per student for non-Members. Stonewall 50 is proudly sponsored by Bank of America. Questions? Contact sunday.scholars@nyhistory.org or 212-873-3400 Ext 356.